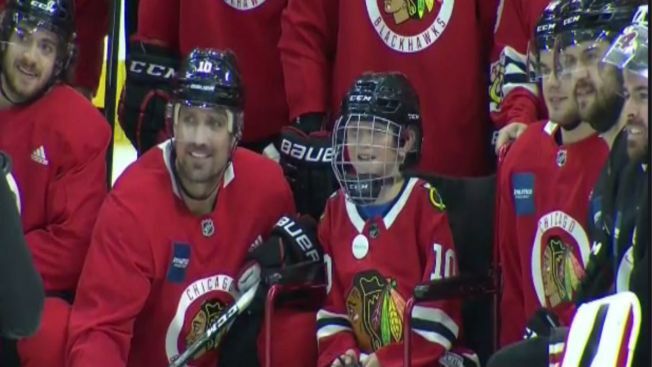 Thanks to a deal that was struck between the Blackhawks and a Make-a-Wish Foundation in Illinois, a 12-year-old who won't let physical challenges keep him down will have his wish come true. NBC 5's Kye Martin has the details. The Chicago Blackhawks have been busy locking up defensemen this month, and they added another one to the fold as they’ve inked Jan Rutta to a contract extension. Rutta, who has six goals and 13 assists in 43 games with the Blackhawks this season, will make $2.25 million next season, according to multiple reports. The new contract for Rutta follows on the heels of Erik Gustafsson re-signing with the team, after he inked a two-year extension worth $1.2 million per season last week. Rutta has been dealing with an upper body injury in recent days, but according to head coach Joel Quenneville he will be back on the ice Thursday night when the team takes on the Carolina Hurricanes at the United Center. Puck drop is scheduled for 7:30 p.m., and the game will air on NBC Sports Chicago.